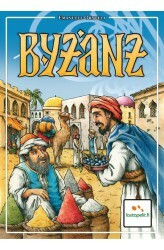 You are a merchant in Byzantium and you are trying to have the most profit from the markets inside the city. Bid for the best stock of goods and find the right moment to sell your collected wares. And do not forget to go to the main market for a good deal! Players are merchants and bid on offers from the market to collect as many sets of 3 cards of the same good. Game ends when all cards have been auctioned and clayers with the highest total of good cards wins. Cards are both: money on your hand for bidding and points for scoring in each set sold. Goods cards and merchant cards are shuffled together and form the stack of goods to be auctioned. Depending on number of players offer cards from 1 to 6 are used (eg 4 players, cards 2,3,4,5) with the high.. The galaxy has been a peaceful place for many years. After the ruthless Terran–Hegemony War (30.027–33.364), much effort has been employed by all major spacefaring species to prevent the terrifying events from repeating themselves. The Galactic Council was formed to enforce precious peace and it has taken many courageous efforts to prevent the escalation of malicious acts. Nevertheless, tension and discord are growing among the seven major species and in the Council itself. Old alliances are shattering and hasty diplomatic treaties are made in secrecy. A confrontation of the superpowers seems inevitable – only the outcome of the galactic conflict remains to be seen. Which faction will emerge victorious and lead the galaxy under its rule? 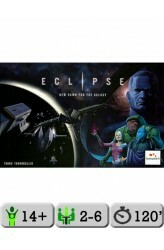 A game of Eclipse places you in control of a vast.. While the galactic conflict escalates and several new factions are trying to get a foothold on the galaxy, the adversaries suddenly need to find allies among themselves to face the rising threat. The systems previously thought to be empty are suddenly swarming with Ancients – whole worlds of them, with ship capabilities way beyond anything seen before. They are not willing to negotiate. 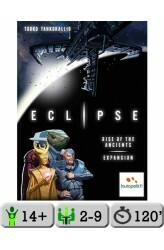 Eclipse: Rise of the Ancients, the first full-size expansion for Eclipse, introduces several new additions to the base game, such as Rare Technologies, Developments, Alliances, Ancient Homeworlds and Warp Portals. There are also three new player boards with four new different alien species to choose from. New components allow up to nine players in one session. Due to the modular design, you c.. The Ancient Uprising has been put down, and a fragile peace again holds in the galaxy...but suddenly, everything changes. Several new factions rise to disturb the status quo. The Unity nanomachines bend energy and matter to their will. The Shaper ships tear the spacetime fabric apart, while insignificant Octantis factions take a developmental leap after leap forward. It almost seems like the base laws of the universe no longer apply. 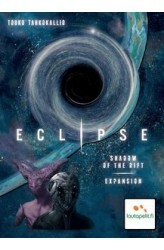 Eclipse: Shadow of the Rift introduces several new mechanisms to Eclipse, including Time Distortion, Evolution and Anomalies, as well as several new Rare Technologies, Developments and Discoveries. It includes two new player boards with three new different alien species from which to choose. Due to its modular design, you can use all of these ..
Eclipse: Ship Pack One includes six unique sets of plastic ship models – Interceptors, Cruisers, Dreadnoughts and Starbases – for the alien species in the Eclipse base game, a Terran/Magellan player board, and some other new components. 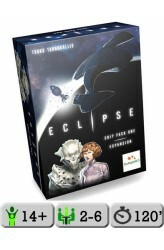 DESCRIPTION: New discoveries await you in this exciting expansion for the award-winning Eclipse, with powerful new technology, ancient alien vessels, and two new species. Try the new turn order variant, explore the new outer sector, and win power for your faction through judicious use of the security council. Best of all, the Eclipse Ship Pack One includes 108 new plastic models, enough for every player to have different ships on the board! With so much to add to the base game, players will find all new reasons to take to the stars. FEATURE.. The excitement in the air is electric as the leaders round the last corner and head for the finish line. Each team has used cunning and skill to position their sprinter for this moment, but only one has done enough to pull off the win! Will your team lead from the front and risk exhaustion? Should you play it safe in the middle of the pack? Could you surprise everyone by striking from the back? Can you time your move perfectly? Anyone can race, few become champions! 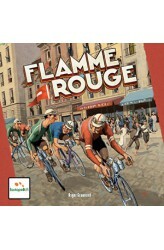 Flamme Rouge is a fast-paced, tactical bicycle racing game where each player controls a team of two riders: a Rouleur and a Sprinteur. The players’ goal is to be the first to cross the finish line with one of their riders. 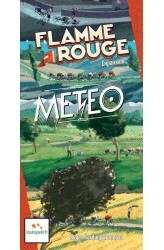 Players move their riders forward by drawing and playing cards from that riders specif..
Flamme Rouge: Meteo, a small expansion for Flamme Rouge, introduces players to weather phenomenons such as storms, side winds, and head winds. https://youtu.be/CgB1va0m30o ..
Flamme Rouge: Peloton, the first expansion for Flamme Rouge, offers a chase group of four riders (pink and white rouleurs and sprinters) that allows the base game to be played with up to six players. All 5-6 player games are played with a breakaway tile and 1-3 supply zone tiles. These can also be added to your games at lower player counts. The box cover shows the iconic cobblestone races that are represented with new tiles in the game; these tiles are mostly one space wide, occasionally two, and don't allow slip streaming. 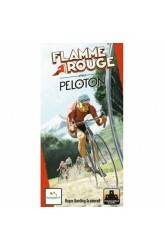 Flamme Rouge: Peloton includes variants for solo play and for games with up to twelve players, each controlling only one rider. https://youtu.be/4HgMFfG6JRc ..
After establishing themselves in Honshu, the Lords and Ladies head north to Hokkaido. Beholding Hokkaido’s mountainous landscape, they see that expansion on this land will prove to be a greater challenge than before. 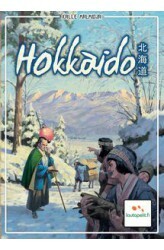 Hokkaido is the second map-building card game in the Nippon series, bringing new ideas and mechanisms to the first design Honshu. A game of Hokkaido consists of twelve rounds, each divided into two separate phases. Each player must expand their personal map to maximize their scoring possibilities. 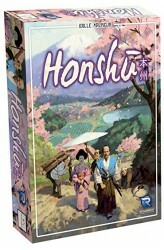 https://www.youtube.com/watch?v=s6mg32Quing ..
Honshu is a trick-taking, map-building card game set in feudal Japan. Players are lords and ladies of noble houses seeking new lands and opportunities for fame and fortune. One game of Honshu lasts twelve rounds, and each round is divided into two phases. First, map cards are played in a trick, and the player who played the highest valued card gets to pick first from those cards played. Then the players use the map cards picked to expand their personal maps. Each player must expand their personal maps to maximize their scoring possibilities. Manipulating your position in the player order is crucial for mastering Honshu. https://youtu.be/QANSQxseriE ..
Nations is an intense historical board game for 1-5 players that takes 40 minutes per player to play. Players control the fate of nations from their humble start in prehistoric times until the beginning of World War I. The nations constantly compete against each other and must balance immediate needs, long-term growth, threats, and opportunities. Victory points (VPs) are mainly gained by building up a great heritage during the game, and through Wonders and Buildings at the end of the game. The game lasts eight rounds, and the Nation with the most VPs wins. http://www.youtube.com/watch?v=1no822vc5J4 ..
Nations: Dynasties, the first big expansion for Nations, includes twelve new Nations with Dynasties as well as Dynasties for the base game B-sides. Two additional new concepts are included: Turmoil (which makes Stability more dynamic) and Natural Wonders (which creates very hard choices and new types of interaction). Together with the new more advanced Progress cards, the replayability is increased significantly. This expansion is recommended when you are experienced with the Expert cards of the base game. https://www.youtube.com/watch?v=D14uWSGP7mM ..